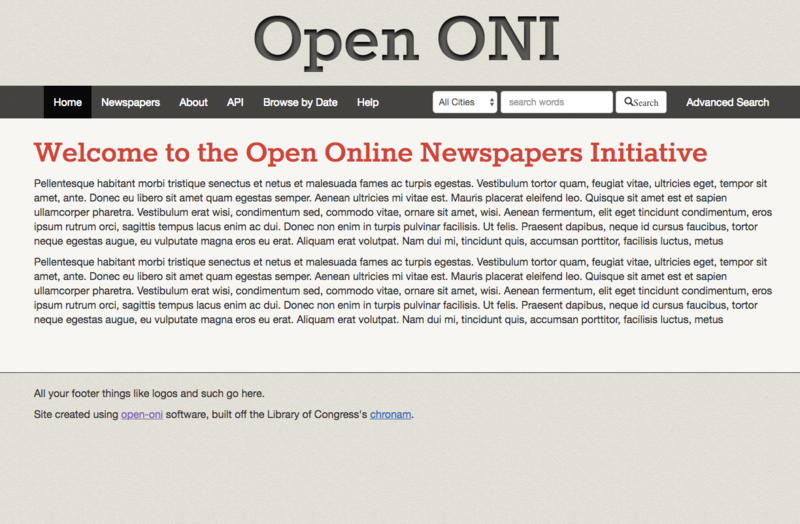 Open ONI is a community-maintained project forked from chronam, the Django application the Library of Congress used to make Chronicling America. Chronicling America makes millions of pages of historic American newspapers that have been digitized by the National Digital Newspaper Program (NDNP) browsable and searchable on the web. With Open ONI, we aim to enable individual state and library-based newspaper collections to provide the same capabilities and develop common features and improvements. Open ONI is currently not ready for general production use outside the institutions who have been able to provide time for developer participation and have deployed it individually. Documentation and changes to facilitate more standardized deployment are under active development, but maintainers can only provide a minimal amount of assistance while working on Open ONI part-time. Developers cannot be expected to provide extensive one-on-one support. We are glad to provide support specifically related to Open ONI, but anyone wanting to work with Open ONI should begin with some foundational knowledge of Linux, Docker, Apache, Python, Django, Solr, and MariaDB/MySQL. There are other resources and communities better suited to aid in getting started and familiar with those technologies, so general assistance with them falls outside the scope of what to expect Open ONI developers to provide. We ask that bugs and feature requests be submitted to Open ONI on GitHub. Please confine other questions and conversation about Open ONI development and use to Open ONI's Slack. These guidelines are intended both to keep conversation in the open where it may benefit all of the Open ONI community and to protect developers' already limited time.